Improving curb appeal has a positive effect on property values and resale. This is the year. Your home is ready for a new look. You’re excited about the possibilities but you don’t know where to begin. Whether you are building new or it’s just time for a refresh, we are sharing some tips and ideas from our product experts to help you get started. Don’t know where to begin? That’s ok, says Justin Finneran, Social Media Specialist for CertainTeed Roofing. Go online and simply type in whatever you are looking for – roofing shingles, vinyl siding, a privacy fence – and you’ll receive hundreds of options. Then start a Pinterest board or an idea book on Houzz. Houzz also offers a fun new sketch feature that lets you build a mood board for your project. You can see how various items work together, add images and take notes directly on the board. 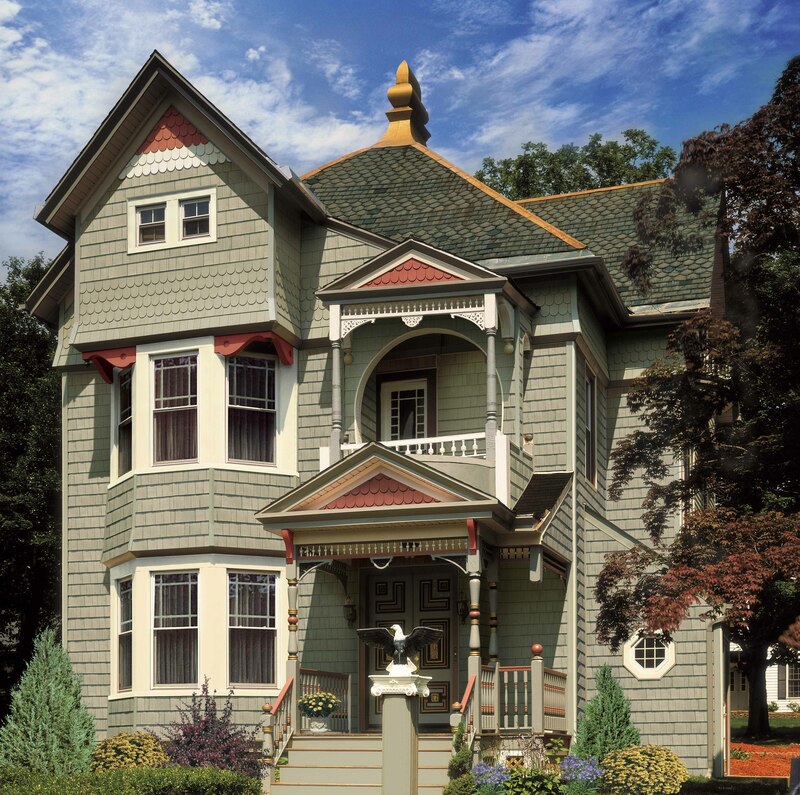 This traditional Victorian uses Cedar Impressions® shingles in Colonial White, Natural Clay and Barn Red. Sometimes you need to look no further than your local community. 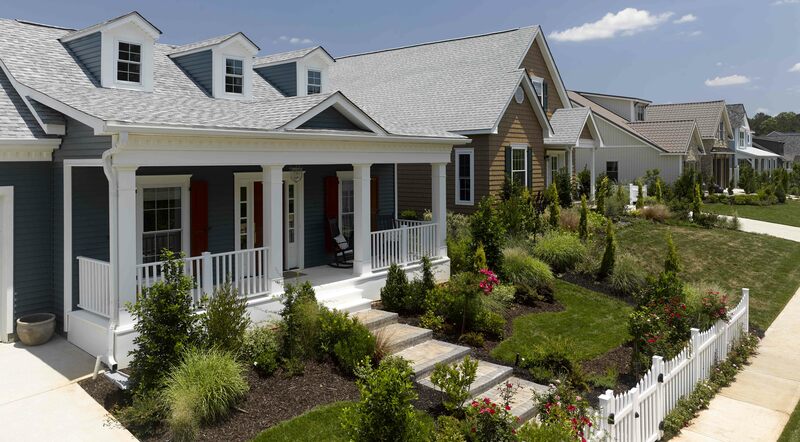 “Driving around your neighborhood, or nearby neighborhoods, or neighborhoods you aspire to live in or like can give tons of inspiration,” says Matt Gibson, Director of Vinyl and Marketing Communications for CertainTeed Siding. Grab your smart phone and start snapping pictures of color and styles you like. Garnering inspiration from your neighbors offers several benefits. These photos can be a valuable tool when you start talking to a contractor. Unlike an internet search which includes images from all over the country and around the world, drawing inspiration from your neighbors almost guarantees you’ll be able to find similar products for your own home. You can see the color and materials in full scale and in multiple lights which are conditions hard to replicate online or in the showroom. You know your home will fit seamlessly into the visual of the neighborhood. If you live in a development with a Homeowner’s Association this may be mandated but even if you don’t there are advantages to bringing curb appeal to your neighborhood especially when it comes to resale. Sometimes the perfect path forward comes from looking to the past. Whether you have a Victorian you want to see elevated to its former glory or a mid-century bungalow you want to reflect the same optimism found in post- World War II America, looking to historical choices can provide ample inspiration and time-tested color palettes. Most major paint companies offer heritage or historic lines you can browse or a quick internet search will let you pinpoint your house style, era and location. 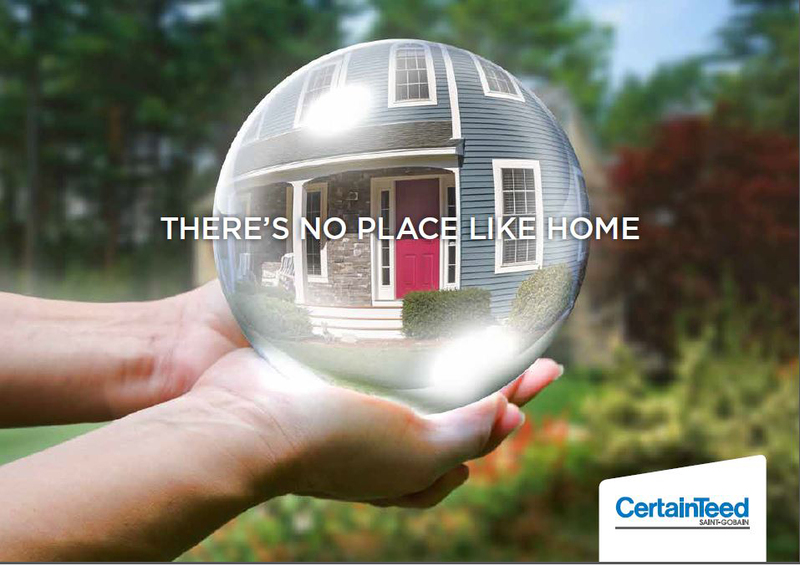 Find our product brochures on Certainteed.com or call 1-800-233-8990 to have one sent to you. Remember those internet searches you were doing? Take note of the manufacturers that keep coming up in the images you like. You can also reference apps, like CertainTeed’s iDreambook, available through iTunes, that combines beautiful imagery with informational videos and product information so you can quickly decide which style works best for your home. Details like Restoration Millwork® Cellular PVC trim and a Bufftech® white picket fence set this Colonial apart. Wherever you go for inspiration, Doug Mucher, Marketing Manager for CertainTeed Outdoor Living, suggests you pay attention to the details. 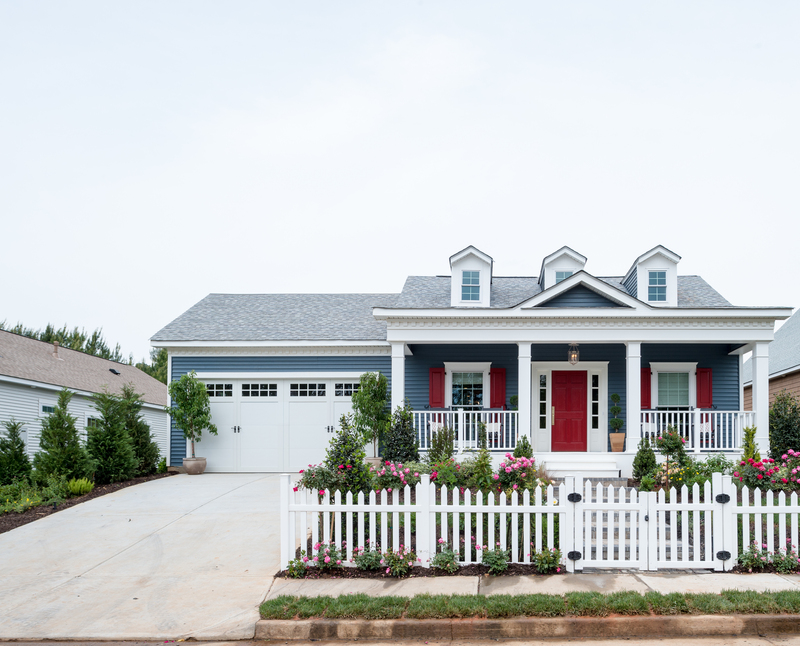 “When it comes to planning their exterior redesign, homeowners often focus on the big picture, spending a lot of time on color. While color is important, it’s the details that can set a home apart,” says Mucher. When you find examples of homes you like take note not only of the colors but of other details like the type of trim used around the windows or under the eaves, the railing and style of columns on the porch or whether there is a fence framing the entrance or surrounding property. Getting these details right can be the difference between a home you like and a home you love. Now that you have a fairly concrete idea of what you like, it’s worth your time to visit a showroom to view your favorite products. Digital photography has come a long way but nothing beats seeing the product in person. And since showrooms often specialize in just a few products, you have an opportunity to get project specific answers from product experts. Getting to see and touch the product in person is often the assurance homeowners need before making their final decision. Like the look of Spanish tile but not the maintenance? Material innovations are delivering beautiful new options to homeowners. 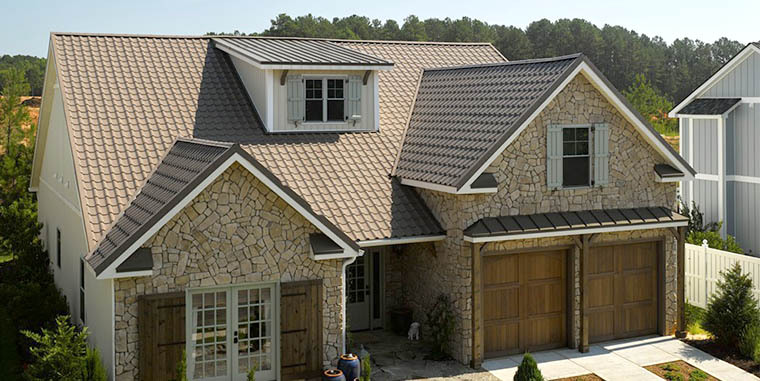 Seen here: Matterhorn® metal roofing in English Toffee tile. Don’t overthink it, advises Finneran. Some of the best final projects are those that put their own twist on a classic. “Inspiration can take many forms, but at its best it is something eye-opening that lets you see things in ways you hadn’t before,” says Finneran. Whether you have printed pieces or a digital gallery, gather your thoughts and ideas and lay them out in front of you. Look for what connects them and what stands out. More often than not you’ll find what you need to get started. Looking for more help? We have more tips, tools and pretty pictures to get you started. Plus, how to use multiple sidings and gorgeous stone fences. Ready to get started? We can help you with that too.